This worksheet can be used not only for the protagonist, but also for secondary characters. The quests of secondary characters may not possess every quest element, but the protagonist’s quest should possess nearly all of the quest elements. The most important elements are emphasized with red type. 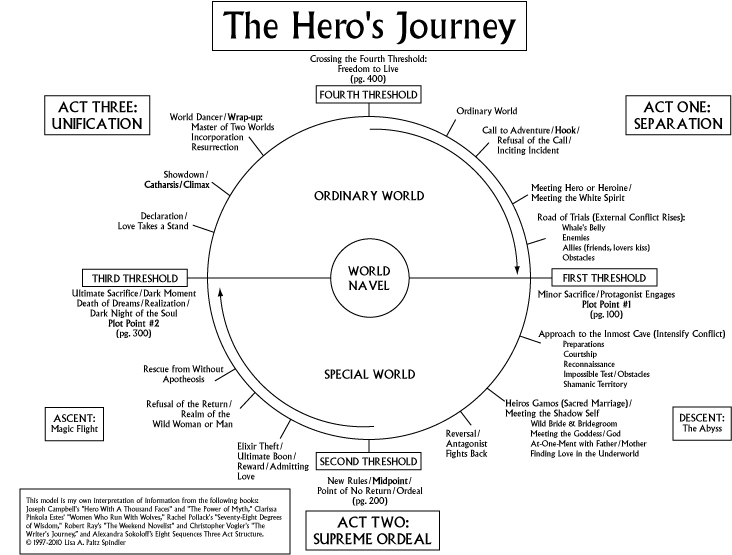 Download a graphic version of the Hero’s Journey in JPG format (172 KB). An integral part of the Departure is the World Navel. Campbell describes this point as the center of the universe, the point from which lifeforce enters the world. When writing a fantasy quest story, you should identify how this pertains to the social and religious/spiritual structures in your plot. This could be symbolized by the opening scene being set in a church/temple, forest or near a spring or river, or household hearth, for example. All are symbolic connections to the World Navel. The Herald/Harbinger as a carrier of the power of destiny plays an integral part in the beginning of your story and the transformation of the Protagonist. The chance or planned meeting with the Herald initiates the journey and therefore the story. This figure is often represented by an animal, such as serpent or dragon. Example: The frog who visits the princess by the wooded well in The Frog King, or King ArthurÃ¢â‚¬â„¢s Great White Hart in Le Morte DÃ¢â‚¬â„¢Arthur. If the Protagonist refuses the HeraldÃ¢â‚¬â„¢s Call to Adventure, s/he then will be bombarded with an assault until acceptance occurs. Example: Briar RoseÃ¢â‚¬â„¢s refusal of the end of adolescence and her subsequent spellbound sleep in the Brothers Grimm tale of Sleeping Beauty. Once the Protagonist has accepted the Call, his/her first act will be the meeting with the Mentor. Often this figure is an old man (hermit) or old woman (crone), although sometimes she can be a young woman (virgin or maid). This figure bestows upon the Protagonist an amulet or some other item that will aid them during this rite of passage. Example: Obi-Wan Kenobi in Star Wars, whose gift to Luke Skywalker is his fatherÃ¢â‚¬â„¢s lightsaber. A Guardian (sometimes an ogre) is the first life-or-death obstacle the Protagonist must overcome. The Protagonist must either defeat or befriend this individual. Example: Gurgi in Lloyd AlexanderÃ¢â‚¬â„¢s the Book of Three, a lovable monkey-like figure who demands to be fed before he will help Taran find the evil Horned King. Often the Protagonist must face death and be reborn before the journey can continue. This can be signified by a physical or spiritual visit to a temple, cave, smithÃ¢â‚¬â„¢s forge, grove of trees, or being be swallowed by a monster. Example: Hercules dives into the sea-monsterÃ¢â‚¬â„¢s throat to save Hesione (Campbell, pg. 91), or Little Red Riding Hood is swallowed by the wolf. The Protagonist “must survive a succession of trials.” (Campbell, pg. 97) This is a deepening of the First Threshold, where the Protagonist must face death and either win or lose. Example: PsycheÃ¢â‚¬â„¢s trials as doled out by Venus as she tries to find Cupid. Femininity with its many faces, represents the totality of knowledge. She is the ultimate Guardian of knowledge and if the Protagonist can withstand the awareness she offers, s/he will be freed by her beautiful aspect, if not s/he will die at the hands of her destroyer-crone aspect. Example: In Raiders of the Lost Ark, Indiana Jones and Marion Ravenwood refuse to look upon the Ark as it is opened, knowing the knowledge imparted to them would also kill them. The entities that emerge from the Ark at first are beautiful and then transform into hags. This milestone can be combined with the prior one as both are symbolic of the Sacred Marriage, itself a metaphor for the ProtagonistÃ¢â‚¬â„¢s understanding of the forces of life and death. Both stages are symbolic of facing mortality and the darkness within (the shadow self), of reconciling the immortal soul with the mortal body. Example: In the Empire Strikes Back, Luke Skywalker confronts the Dark Side of himself on Dagobah when he faces Darth Vader in the cave. This scene also incorporates the Belly of the Whale phase. “At-one-ment” with the father is symbolic of shedding the male ogre aspect of God (like the Meeting with the Goddess in her maiden/crone aspects). The Protagonist must recognize the ogre in him/herself and discover the loving father. This also is a deepening of the shadow self awareness begun in the Woman as Temptress phase. Example: Luke Skywalker banishes Darth Vader and resurrects Anakin Skywalker in Return of the Jedi. Deification of the Protagonist, where s/he learns to shed biases and truly achieves “at-one-ment.” The point where the Protagonist breaks past cultural bonds into a broader awareness, a deepening of the Atonement with Father and Meeting with the Goddess phases. Example: Dave Bowman becomes the Star-Child in 2001: A Space Odyssey, or Obi-Wan Kenobi joins with the Force when he is slain by Darth Vader in Star Wars: A New Hope. A gift from the Universe or from the gods, the Elixir of Life is an item, knowledge or a power/ability that the Protagonist must bring back for the benefit of the world. Example: King ArthurÃ¢â‚¬â„¢s Holy Grail, JasonÃ¢â‚¬â„¢s Golden Fleece, or Luke SkywalkerÃ¢â‚¬â„¢s understanding of and ability to use the Force. The Protagonist may not desire to return to the ordinary world, or the Otherworld Guardians may prohibit him/her from returning. Example: In Indiana Jones and the Last Crusade, the Grail Guardian/Knight opts to remain in the cave; Little Red Riding Hood is eaten by the wolf; BowmanÃ¢â‚¬â„¢s Star-Child in 2001: A Space Odyssey, who not only doesnÃ¢â‚¬â„¢t return to the world, but destroys it. Once the Protagonist possesses the Ultimate Boon, the return to the ordinary world may be sanctioned or unsanctioned by the Guardians. If sanctioned, the return is a Magic Flight full of Supernatural Aid. If unsanctioned, the Guardians will try to stop the return with supernatural obstacles. Example: Cerridwen chases Talesin in many forms after he steals from her brew of wisdom in the Hanes Talesin. If the Protagonist refuses to return to the ordinary world or the Guardians prohibit his/her return, s/he may be rescued by another being, mortal or immortal. Example: Little Red Riding Hood is rescued from the belly of the wolf by the hunter. The Protagonist must reconcile the two worlds: the ordinary and the other, and render the discoveries of the Otherworld in terms ordinary people understand. The Protagonist must let go of the past and embrace the future. Example: In Indiana Jones and the Last Crusade, Indy begins his journey by searching for the Holy Grail, but in the end he must leave it behind and realizes that the true Elixir is the renewed relationship with his father. The “Great At-One-Ment,” the Protagonist gives him/herself over to their destiny, letting go of the fears that earlier bound them and necessitated their rebirth. Example: In Lloyd AlexanderÃ¢â‚¬â„¢s The High King, Taran accepts the kingship bestowed on him by Gwydion, son of Don, and remains in Prydain rather than journey to the Summer Country. He has seen the Otherworld, both the dark and the light and he has brought the treasures stolen back to the ordinary world. A deepening of the Master of Two Worlds occurs here, with the Protagonist reconciling his/her individual consciousness with the universal will. The Protagonist is ready to face the world, energized by the Quest. It is the journey that matters, not the destination. Example: In Sleeping Beauty, Briar Rose gives up her fears of adulthood and with the prince enters back into the ordinary world, where life continues as it had been before her ordeal.